Voices from the Field: RSY vol.2 - “TA-BE-SA-IN!” project started and people’s faces lit up. / ► RSY vol.2 - “TA-BE-SA-IN!” project started and people’s faces lit up. It has been about 10 days since we opened Kizuna-kan Volunteer Center on April 23. Nearly 50 - 60 volunteers stay here every day, including the people who come by RSY Volunteer Bus Service. Ochanomi Café at the Volunteer Center, open daily, has its regular customers now. Some visit us frequently, true to their words of “I’ll come here every day”. We have about 15 customers a day. Today, we would like to introduce the “Ta-be-sa-in!” project. This project started with an idea of Ms. K, a local volunteer in Shichigahama. Soon after the evacuation shelter opened, Ms. K was volunteering as a listener [i] . One day, she was shocked to see a very elderly person still having instant cup noodles, and saying, “Of course I’d rather eat something else, but it can’t be helped.” This struck Ms. K to come up with a thought, “How can I serve these seniors at least some of the kinds of food they used to have, such as pickles and ohitashi (boiled green vegetables)?” With the help of her neighbors, she began gathering fresh vegetables and delivering salad, ohitashi, pickles and fruits to the evacuation shelter several times a week. In the evacuation shelter, meals are provided in the mornings and in the evenings. In principle, people living in the shelter take turns to cook meals. As they have to cook for as many as 400 people at a time, they cannot make very elaborate meals. Even though they take turns, daily meal preparation is still a heavy burden on them. Nowadays, many volunteers come into this disaster affected area, and prepare and serve hot meals. In many cases, they serve lunch, but they occasionally serve supper, too. These dishes are very popular among children and young people, who form a long line to get these foods. The elderly people often find such dishes too heavy. Many of them said to me at the café, “I used to eat mostly fish and vegetables, so I can’t eat these greasy foods.” We wanted to help them in some way because we have a kitchen in Kizuna-kan. Then Ms. K dropped by and talked about her group’s activity. “If only we had vegetables and a kitchen, we could provide food more regularly”, she said. With those words, the idea of our collaborative project occurred to me. RSY would provide fresh produce received from our other voluntary activity based in Miyazaki, Kyushu, located far south-west from Northeastern Japan (Tohoku). It is the area affected by the January 2011 Mt. Shinmoedake explosion in Miyazaki, where RSY had also provided support. After the March 11th disaster in Tohoku, the farmers there started to send us their produce saying, “We would like to be of some help for the people in Northeastern Japan, too.” “How would you like the following idea?” RSY would contribute some of these vegetables to the project. 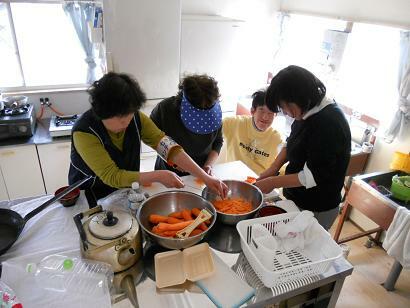 Then, people from Ms. K’s volunteer group, “Shichigahama Women’s Group”, and “Yui-no-Kai”, another local volunteer group, would prepare food with these ingredients in the kitchen of Kizuna-kan. The local and outside volunteers would deliver the meals to the evacuation shelter. As I shared this idea with Ms. K, she immediately said, “Let’s try it right away!” Four or five volunteers came to join her on the same day. Several kinds of pickles were prepared instantly. Then, some local volunteers delivered the pickles to the elderly people at the evacuation shelter. “Thank you”, they said, with tears in their eyes. It is probably not an overstatement to say that this project is now vital for the elderly people in the evacuation shelter. Needless to say, the meals are important to keep them healthy, but even more than that, the food that is prepared with care and delivered with a smile must surely provide much needed comfort and encouragement. Reported by Ai URANO, Rescue Stock Yard (RSY, based in Nagoya) from Shichigahama, Miyagi, Northeastern Japan. [i] Listeners are volunteers who intently listen to and communicate with people in the shelters. [ii] As of June 1, 2011, fresh vegetables are regularly provided to the shelter by the volunteer group in Aichi, RSY’s home town. Re: The Relief & Recovery Report from Shichigahama, Miyagi: “TA-BE-SA-IN!” project started and people’s faces lit up. I don't know that they still suffer from the lackless of food and vegatables. Hope the project can help more people. This is Norio Okada heading this Voices from the Field (VfF) Initiative. Many thanks for your continued participation and concerns. YES, the way victims suffer is changing day by day, and month after month. It also varies from place to place. Sorry, we (VfF) are yet slow to release new reports and also not enough to update you all on how things develop with ups and downs. Please give us some time to make our publications more dynamic. In the meantime we expect you to give us your continued messages. I'm sure this is my first time logged on, but I've read this article before. Could it have been picked up by an international newswire? There is so much going on in this world; we can't let the continuing suffering from the earthquake/tsunami in Japan slip out of the public view. This is Norio Okada heading this initiative. Thank you, Sharon, for your continued attention, participation and concerns. Just like other RMs' comments and feedback, it's very encouraging us and also brings us a new dimension or viewpoint. Thus we can observe and describe better what's going on in the reported places. One thing to add to Yoko who is quite familiar with the place highlighted. “Who actually decides on what, when, for what reasons and how”- this seems to be also an important (but very complicated) question to be addressed in response to yours. However, I (who work quite remote from these places) don't have any appropriate answer to that. Probably our major mission now is : we just keep observing, learning and reporting on how things are going on. Thank you and welcome your continued participation. Thank you, Okadasan. I believe too that the reporting needs to continue. It's crucial to keep focused on the needs of the victims so recovery can happen. So much is happening around the world that it is easy to forget the earthquake victims continue to suffer. Re: RSY vol.2 - “TA-BE-SA-IN!” project started and people’s faces lit up. WHY have the Shichigahama town authorities stopped accepting any more relief provisions? Is anyone challenging this decision? Thank you for the question. There were several reasons for the decision. One is that warehouses in the town have been already full with donations. At the initial phase, items were gathered at the center, but they could not been delivered to each shelter or survivors' house due to the short of fuel. Therefore most of items have stayed at the center (e.g. town gym) and the small town could not increase its capacity. Similar trouble happened in many affected area. Second one, following the above reason, is that fresh vegitable were very difficult to deal with. At that time dried or canned foods were preffered as aid supply. People in Shichigahama, who had healthy diet before the earhtquake, of course accepted them without any complain. However it is ovbious that they starved for any fresh food at that time. Again, thank you for your question and any further ones are welcome. Thank you, Yoko. It makes perfect sense to me now. If storehouses are full, goods must be turned away. But so important is the emotional support that volunteers are giving. No wonder some had tears in their eyes and others' faces lit up - so great how you are making them a bit more satisfied, healthier and providing more life energy, too, to the evacuated people! I also find the concept of listener extremely important. Amazing how something so dreadful can create the space for so much heartfelt good. I wonder how one could keep some of the community based concepts you are creating and testing (based on volunteers and empathy) when life starts to get more "normal" again; or even transfer some of your concepts into other parts of the world that were not striken by a disaster. This is Norio Okada heading this Voices from The Field initiative. Many thanks for your encouraging remarks. 1. how something so dreadful can create the space for so much heartfelt good. 2. how one could keep some of the community based concepts you are creating and testing (based on volunteers and empathy) when life starts to get more "normal" again; or even transfer some of your concepts into other parts of the world that were not striken by a disaster. I have one small question, this article states that donations of food are coming from different parts of South-west and Nort-east Japan, are any other international or neighbouring countries also sending donations or aid? and if the answer is YES, then I would be curious to know what type of aid the other countries are sending? Urvashi san, it may a long answer for your short question. Hope you get interested in it. Upon this disaster, so many NPOs and volunteer groups are operating on the fields including Japan-based international NGOs which usually work on developing countries supported by UN or Foreign Ministry. To tell the truth, much of international aid flow into these organizations because they have been in the same "community" since before the earthquake.